short girl, long island. : Thank You, Jason Mraz. 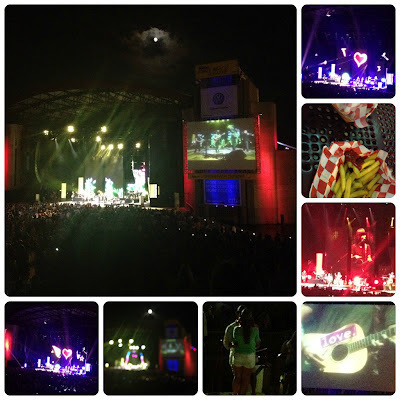 Saturday night, Erich and I attended Jason Mraz's concert at Jones Beach. Erich hadn't been to a Mraz show before, so when I attempted to describe how the experience would be, I said that he would feel more connected to the world, and have a sense of gratitude. That might sound a bit strange to say about seeing some dude sing and dance on stage. 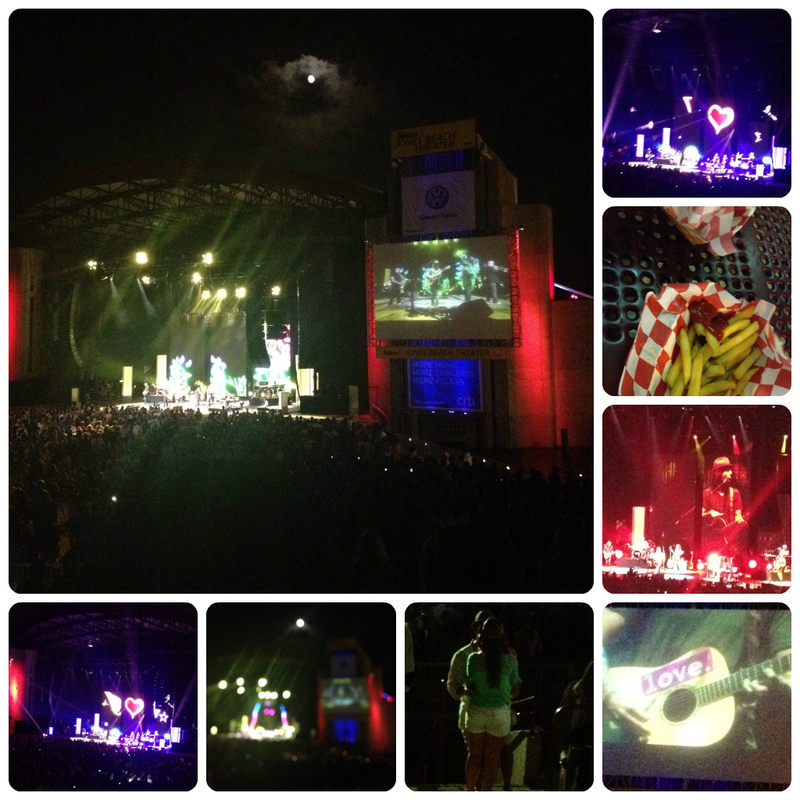 Obviously, you haven't been to a Jason Mraz show before. We arrived at the venue while Christina Perri was on stage, so we grabbed a bite to eat, while listening to her at we sat at a picnic table. It was pretty windy, so I snuggled up to Erich as we ate our hot dog and fries. By the time we finished, we were ready to head into the theater to enjoy the music. We waited until the last minute to snag tickets, so the seats weren't the best, but they weren't the worst, either. When the show began, I looked at Erich, who didn't know what to expect. I just smiled, because I knew he was in for a treat. Mraz's shows are not just about the music. He makes a genuine connection with everyone around him. He came in a few bars too soon when performing "The Remedy," and after he finished the song, he made up a little ditty about how he came in too early, and how his band forgave him. He asked the audience to forgive his mistake from five minutes ago, and five years ago. Then asked us to forgive his mistakes five minutes from now, and five years from now. He also mentioned that in order to enjoy life, we need to leave the past in the past, and live in the moment, which was the perfect segue to the song "Living In The Moment." I was super stoked to hear him play "Plane," which is one of my favorite songs, which is on his 2005 album Mr. A-Z. I've seen him perform a handful of times and have never heard this song live. He also played a song I have never heard before, called "When We Die." It automatically reminded me of Dominic, and I started to cry. My cousins Lori and Joe were at the show as well (it was Lori's birthday and Joe, being the awesome guy that he is, snagged tickets to give her on Mother's Day). I knew that they were thinking of Dom while he played the song. The best I could do was find a video of the song. Take a moment to listen to it. I hope this song will pop up on a future album. Its so beautiful and moving. The rest of the show was phenomenal. The sky looked gorgeous and the moon shone brightly over us. We had sing-alongs, high-fives with strangers and a guy even proposed to his girlfriend during "I'm Yours." Its one of the pictures in the collage, so if any of you reading this know who those newly engaged folks are, let them know that we are super happy for them and thought it was the cutest thing in the world. We left right before the encore, because we wanted to beat traffic and Erich wanted to catch the final games of a three-day StarCraft II tournament that Red Bull had been hosting (yes, we are are down with eSports). On the ride home, we spoke about the evening. I told Erich that whenever I leave a Mraz show, I feel centered. Grateful for the things in my life. He agreed that the show was more than just music, and said that he would see him next time he was in New York. Every day, I have made sure to acknowledge the good and the bad. I have expressed daily gratitude to the universe. I am thankful for everything and everyone in my life. Including you, reading my blog. It means so much that you have taken precious time out of your day to read the words I have written. Thank you, thank you, thank you. I mean that from the bottom of my heart. I even took a step back from the blog and the 'net yesterday, to live in the now. Appreciate my surroundings. Enjoy life. Once you're done reading this, I encourage you to unplug from technology for a bit today. Enjoy something with everything you've got, even if its just for a few minutes. Dance around to your favorite song. Make a cup of coffee. Take a walk around the neighborhood. Hug everyone in your house and tell them you are grateful for them. Whatever floats your boat. Just make the most of your time here on earth.